Canada’s beloved Tragically Hip will be hitting the stage one last time this weekend in Kingston, ON. And if you couldn’t catch them in Toronto last week, there’s still a chance to see them live in the city. Perhaps not live at the Air Canada Centre, but on a big screen, and still among hundreds of other Hip fans. 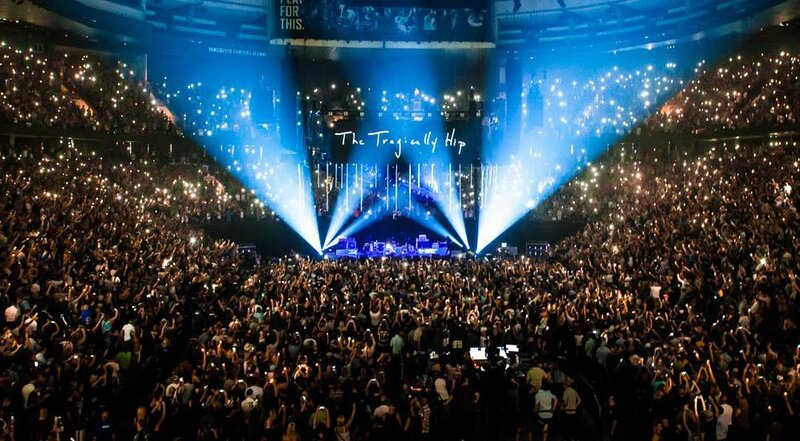 As the Man Machine Poem tour comes to an end, CBC and The Tragically Hip present “The Tragically Hip: A National Celebration,” which will be broadcast live across the country. This free screening will be broadcast on the 420 sq ft screen at the Danforth Music Hall. Entry is free with RSVP to [email protected] All RSVPs are good for entry, but it is subject to capacity. In 1992, The Tragically Hip performed at the legendary Horseshoe Tavern. Now, you can catch a live broadcast of their final show at this legendary space. This event is free, and donations will be welcome. 100% of the donations will go to the Gord Downie Fund for Brain Cancer Research. Catch the final hip screening at a movie theatre. The free concert screening will have tickets available in person at the box office. Carlton Cinema will also be accepting donations to the Canadian Cancer Society at the box office. The Junction City Music Hall is hosting a free screening of the Hip show, promising big screens and great sound. There will be donation jugs at the bar, with all proceeds going towards the Sunnybrook Gord Downie Fund for Brain Cancer Research. Another cinema screening, this time at the Hot Docs Ted Rogers Cinema. For this screening, members can access tickets on their website. A free community screening will take place at Revue Cinema. Although some seats will be reserved for members, the rest will be on a first come, first serve basis – so get there early. There will also be Canadian music trivia, followed by the concert at 8:30 pm. Marking a CNE-first event of its kind, the highly anticipated concert will air live on the CNE’s Bandshell Stage on Saturday. Celebrate with hundreds of others in this iconic summer venue. Free with admission. Where: CNE, 210 Princes’ Blvd.